Dame Judi Dench, as she is popularly known as, has come out recently to voice her total hatred for also being called a “national treasure”, which given that it’s a term she’s been hearing for God knows how many years is completely understandable. Though the Oscar-winning actress is indeed a favourite of many, after her numerous appearances in the Bond franchise and other crowd-pleasing hits like The Best Exotic Marigold Hotel and Philomena, she must surely be sick and tired of people knowing her as one of the major icons of British cinema, especially when at the end of the day she is just a hard-working actress like the rest of them, and is still going strong at 82 years old. Maybe she just needs to stop delivering such excellent and watchable performances – which is impossible because, well, she’s Dame Judi friggin’ Dench – in movies that even come up short of her natural abilities, like Victoria & Abdul for instance. That way, she can relinquish her hated “national treasure” moniker for good; but let’s face it, that’s just not going to happen. Sorry, Judi. She is the Victoria of the title; Queen Victoria to be exact, a role she had previously played – and was even Oscar-nominated for – in 1997’s Mrs. Brown. Her portrayal in this film, directed by her Philomena and Mrs. Henderson Presents director Stephen Frears, is that of a Victoria way past her prime, getting ever older and more disconnected from her daily royal duties. She is a woman isolated by her very sovereignty, attending several banquets and events with all the enthusiasm of a dog that’s about to be put down. An unexpected jolt of life, however, arrives in the form of Abdul Karim (Ali Fazel), a young Indian clerk who has been transported from Agra to England as a new royal servant, and who Victoria takes such a liking to that she soon promotes him to be her “Munshi” or her teacher, leading the two to develop a special friendship. Of course, none of this sits well with the royal household, especially Victoria’s son Bertie, later Edward VII (Eddie Izzard), whose attempts to separate the two are so cartoonishly over-the-top that you’re surprised that nobody twirls their moustache at any point. That’s arguably the biggest oddity about Victoria & Abdul, the fact that it feels more farcical and over-the-top than it even needed to be. The attempts by the royal household to discredit Abdul in any way they can, from his Muslim heritage to the fact that he may be riddled with gonorrhoea, become so ridiculous that you could see a more straightforward satire being made out of a situation like this, but when it’s spliced in with some of the more serious elements it just feels like tonal whiplash. A lot of the actors are given parts where they appear to have been told to play them as pantomime villains; you half-expect most of them to bust out the old “Oh, no he’s not!” bit, and are so one-dimensionally evil that they’re just inviting boos and hisses from the audience. I understand that there was some tension and jealousy going on in the actual Victorian royal household, but this movie just makes it all seem so cartoonish and needlessly over-the-top, when perhaps Frears could have opted for something a bit more subtle to match other parts of the movie; maybe that’s where the opening disclaimer that it’s “mostly” based on truth comes from. When it doesn’t go too overboard in its depiction of royal stereotypes, the film has a very light-hearted tone that literally anyone can easily swallow, whether they be a slightly older crowd, or younger kids dragged to this movie by their parents or grandparents (maybe they’re who the overblown farce element is made for, but that just makes the movie seem more childish than it needs to be). The central relationship between Queen Victoria and Abdul Karim is sweet and simple, even though a lot of the time there is a noticeable lack of conflict that makes it difficult to make truly cinematic (even at points where it looks like they are going to be torn apart, it’s all resolved in the next scene or two). But Fazel makes up for his character’s bland naivety with a strong, steadfast charisma that makes it easy for anyone to instantly like him, while Dench – arguably the best thing in the whole movie – brings a relieving freshness and giddiness to a historically dour and unflinching figure; she injects amusement into a woman who was so famously not amused. It is a bit of a strange film to sit through, though, because while there’s no doubt there were good intentions behind the making of this film, and in an era where Muslim antagonism is sadly more commonplace in the news and in certain politics it’s positive to see a pro-Islam movie in contemporary cinema, the steps it takes to get to where it needs to be are so oddly out of place and more often than not way too simplistic to be subtle with, that it makes for a tonally mismatched movie that seems unsure of how it wants to tell its story. If it opted for something more intimate and low-key, that’s fine; if it wanted to be more of a farce with how it portrays the reaction to their pairing, that’s also fine; but Victoria & Abdul wants to have its cake and eat it too, and only realises when it’s too late that they not only don’t gel together well at all, but they make for a film that’s just not wholly smooth to consume. It’s a shame, because there are some things to like – including Dench who, despite her recent comments, couldn’t be more of a national treasure if she tried – but it’s just not completely there. 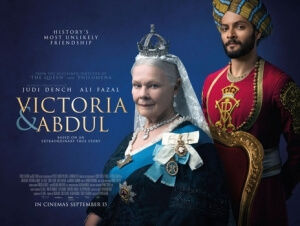 Victoria & Abdul is an oddly jumbled affair, on the one hand presenting a simple and sweet central pairing, including an ever-awesome Judi Dench, but on the other depicts pantomime-level antagonism without much in terms of subtlety.